The view a short time ago.. When you flying back to ol' Blighty??? Ohs share the name if you please? Congratulationings upon makin' it stateside again, even if just for a bit, ..for now.. :D pip pip ! 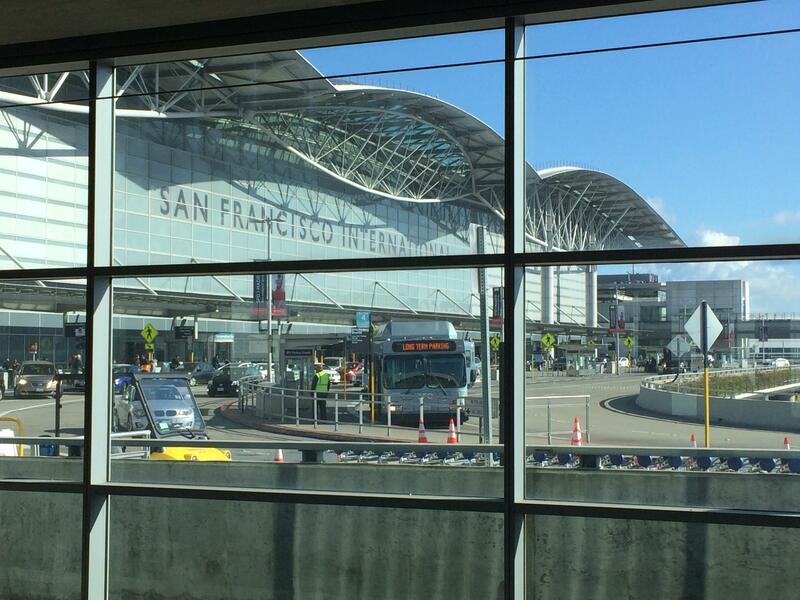 The last time I flew in/out of SFO was 1980. I imagine it looked largely the same, but I really don't remember. You were old enough to fly in 1980? ^_^ (Actually, I think the first time I flew alone was somewhere around then - I was going to visit my stepsister, then living in Napoli, where, if I recall correctly, she eventually met the guy who would become her husband) I think it's largely as it's been for a long while, modulo the highly welcome extension of BART to the airport itself, though the first time I saw SFO was around 1994 or so. I should probably hold back from the temptation to go coding at the beach, though - not only because it's not hugely warm just yet, but mainly the way sand gets everywhere. ^_^; Still, if there's something useful I can do just with inspecting the code, that I could do on the iPad fine..
Silly rabbit. Know ye not that I am Ye Olde Fart? I first flew in 1972: I went to Texas and spent part of the summer with an aunt and uncle (doubly-related: my mom's brother and my dad's sister). I remember it specifically because it was the Munich Summer Olympics and it was the year of the Israeli athlete massacre. 1980 was my high school graduation. In my junior year I was hanging out with a friend who was a senior. After he graduated, he and his mother moved to San Fran. When I graduated the following year, he called me up and told me he'd enlisted in the Air Force and had a couple of weeks until he had to report, so I flew out and we spent a week (mildly) terrorizing the town. I soon lost all contact with him, only to regain contact with him in '12, finding him in DC via Linkedin, of all things! I get to see him every year now that I'm in a study at NIH and conveniently, his mother, who had moved from SF to Hawaii, had moved again from Hawaii to Scottsdale! So my wife and I got to see her when we were in Phoenix for Thanksgiving. I should have added that, amusingly, I'm using my ticket from the Monterey Aquarium from 2002 as a bookmark right now, which was my most recent trip to the area. Previously I was in the area in 1990 when I went to San Jose for an anime convention, then drove up to Portland, then down to Las Vegas and back to Phoenix. *hug! * Yep, I need to maintain focus, despite all the pulling back to old haunts like the Magnolia. There'll be time enough for those. =:) I think today's focus needs to be on looking at the optimization target the CTO has a yen to apply the treatment to, gaining a better understanding of what opportunities there might be for CUDA there, and then, how to go about that. I always find that the sooner I start working with the target the better. Oh hey! I suppose you won't have time to go out looking for otters on this trip? Are you staying in the city somewhere? Ping me if you have time and want to go out for some otter photography. Gah, it's been a busy time. ^_^; Might there be any chance of some otters on the morrow? The weather's looking like it could be good. I'm presently down in Sunnyside, near Glen Park and Balboa Park stations. Nope, no Telegram/Discord/etc, though I have been dabbling with Mastodon, which doesn't consume much time, and has a really pleasant, quite inspiring feel - it's somewhat Twitter-like, but rather than being one monolithic entity, it's a federation of smaller nodes, each with their own particular emphasis, be it furry, photographic, LGBT, or what have you, so jerks don't get a chance to proliferate, and there's an innate sense of "local culture", as it were. Pretty cool! Notwithstanding, email's easily the best way to reach me (and by extension, here) - when I'm "at home", Mail's always displaying any new email count down in the Dock, and on the move, I'll usually check email a few times an hour. Ah, poop! Not to worry - there'll hopefully be other opportunities later in the year. I don't suppose you've encountered many leporids in the Bay Area itself? I tried searching on a previous visit, with about the only success being up on the hilly trails of San Bruno Mountain Park - trouble with those, though, is the buns are only visible on their terms, as once they're off the path, and into the scrub, they're all but invisible. =:/ Needless to say, I'd absolutely love to have a spot reachable by BART/Muni/AC Transit/SamTrans/Golden Gate where I have a fair chance of seeing buns go about their lives - I'd really prefer not to have to abandon rabbiteering! Especially not now that I finally have the lens back in action, and all but good as new. I've seen rabbits in many of the local parks, but they're all like the ones at San Bruno, skulking beside the trails and running off into the bushes when you get close. The "hanging around in groups in the open where you can set up with a big lens on a tripod for photography" niche here is occupied by ground squirrels. Sacramento NWR has a population of jackrabbits that are good for photography (from your car along the auto tour route). For more advanced rabbiteering I like to look for the pika when I get up to Yosemite. It's hard to think of too many major airports these days that are cool architectural experiences, or are otherwise interesting in a human scale. (Seattle is probably my favorite in the US, just because of that cool central concourse.) Part of me really wishes I'd been a traveler in the early days of international air travel, when it was all glamorous and quirky. What I wouldn't give for a transpacific ride on a Pan Am flying boat!